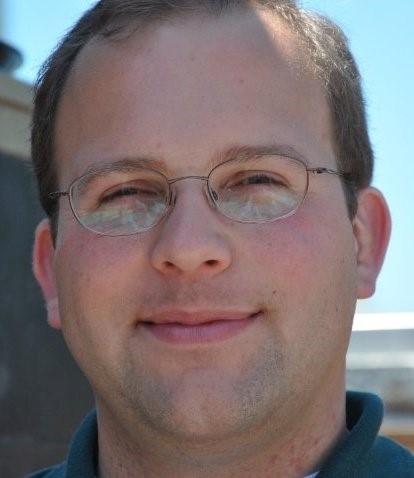 Steven Worker is the 4-H Youth Development Advisor for Sonoma, Marin and Napa counties. 4-H uses a variety of volunteers for it's programs. Steven conducted a study of volunteer educators, with a "diverse experiences, abilities and values" to teach STEM projects to students using 4-H curriculum at three sites using three different methods. Youth programs implemented during out-of-school time often rely on volunteers. These volunteers are responsible for selecting and adapting curriculum and facilitating activities, so their pedagogical practices become primary contributors to program quality, and ultimately, youth outcomes. To describe volunteers' pedagogical practices, I conducted a qualitative case study at three sites where volunteer educators were implementing a design-based 4-H curriculum. 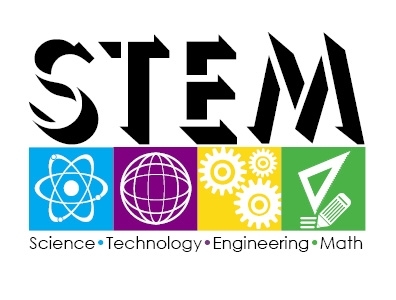 The curriculum advanced youth scientific literacy by supporting scientific inquiry in conjunction with planning, designing and making shareable artifacts. Through detailed observations, videos and focus groups, I identified six common pedagogical practices, though educators differed widely in which ones they used. Pragmatic and structural constraints shaped their choices, as did their professional identification as engineers, or not, and their relative comfort with engineering. To support volunteer educators in implementing a learner-centered educational program, curricula designers might be more specific in recommending and explaining pedagogical practices, and program managers might better train volunteer educators in those preferred practices. Read this research article is in California Agriculture, volume 71, number 4. Citation: Worker S. 2017. Volunteer educators bring their own ideas about effective teaching to a 4-H curriculum. Calif Agr 71(4):208-213. https://doi.org/10.3733/ca.2017a0021. 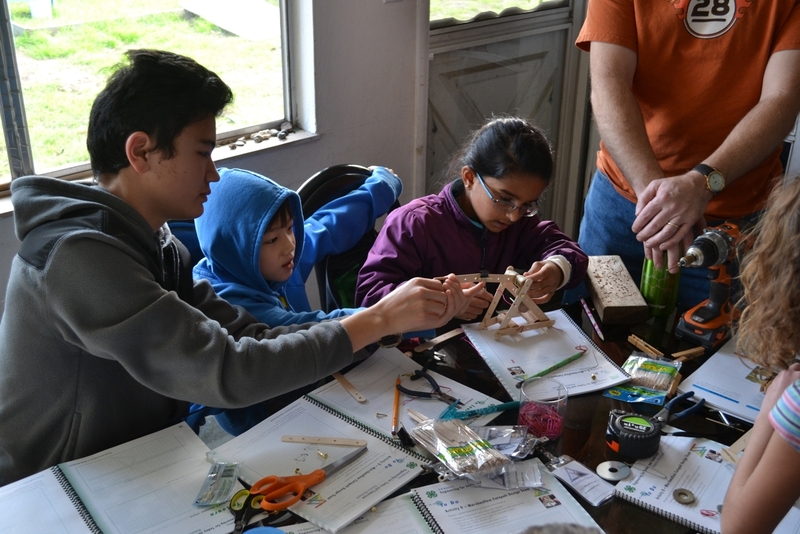 To help improve scientific literacy among youth, the 4-H Youth Development Program offers a design-based science curriculum, Junk Drawer Robotics, that features engineering activities. 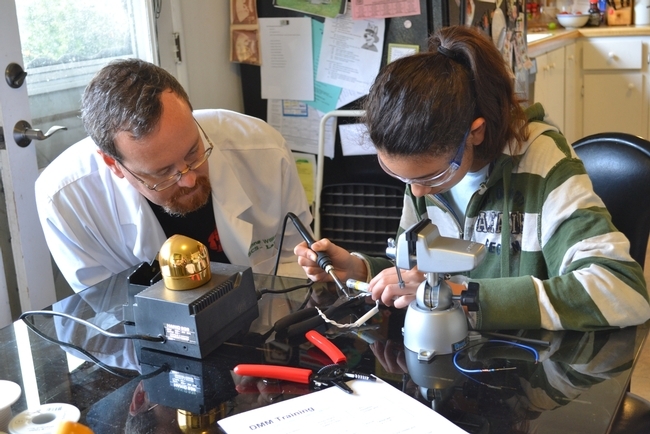 A girl follows the adult educator's instructions to solder two wires together to make a bracelet. As a new Cooperative Extension Advisor, Worker will provide leadership, support, and oversight to 4-H Youth Development clubs, camps, and programs in Marin, Sonoma, and Napa counties. In partnership with the respective County 4-H Program Representatives, he will connect local 4-H Clubs and programs to exciting new 4-H projects and initiatives. Worker's academic responsibilities include developing, implementing, and evaluating programs to engage youth in healthy living; science, engineering, math and technology; environmental stewardship; and civic engagement. 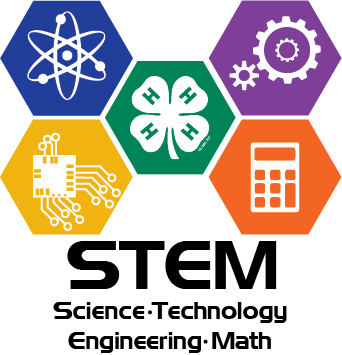 For fourteen years, Worker was at the California State 4-H Office where he served as the California 4-H Science, Technology, Engineering, and Mathematics (STEM) Coordinator, and earlier as the State 4-H Program Representative for youth leadership, recognition, and technology. Worker is a 4-H alumnus from Santa Barbara County where he was a 4-H All Star, a 4-H camp counselor, and a State 4-H Diamond Star. Worker earned his PhD in Education from UC Davis in 2016 and his MS in Community Development from UC Davis in 2007. Worker and his wife, Heather, recently moved to Rohnert Park and are excited to explore the North Bay. Worker is a tabletop (board and card game) enthusiast and an avid science fiction reader. Contact Worker at University of California Agriculture and Natural Resources, Cooperative Extension Marin (415) 473-4207, Sonoma (707) 565-2836, or Napa (707) 253-4221, or by email at smworker@ucanr.edu or view his bio and publications.